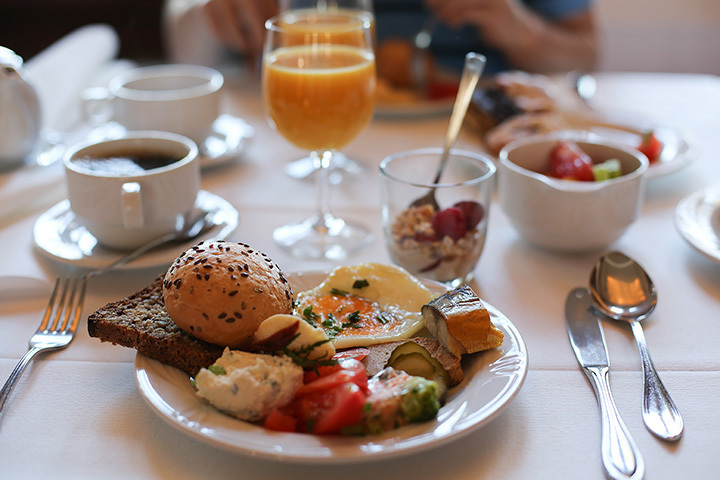 Brunch is an event, one of those moments that brings people together for a leisurely morning meal. The pace is slower so everyone can focus on the food, quite often a special menu of chef favorites. Here are 10 restaurants in New Mexico where brunch is not just a meal between breakfast and lunch but a standout in its own right. Open Table, the online reservation service, collated the millions of diner reviews they get every year and came up with “100 Best Brunch Restaurants in America.” This restaurant made the list for so many reasons including the commitment to serve seasonally inspired cuisine to using locally-sourced ingredients and, most importantly, to showcasing food in unique and creative ways. Brunch is served on Saturday and Sunday from 9 a.m. to 2 p.m. Do not miss the house-made pastries, breads, desserts and hand-ground chocolate creations. Who doesn’t like a buffet? There are so many delicious choices, or you can just choose that one favorite dish and eat it to your heart’s content. Every Friday from 9 a.m. to 3 p.m. the Casino serves a special brunch at the Feast Buffet that includes an omelet and waffle bar, a freshly brewed flavored coffee bar, live-action carving station and salads, pizza and desserts that are sure to satisfy any sweet tooth. There are many traditions at this historic Lodge in the Sacramento Mountains, not the least of which is longevity. Originally built in 1899, it burned to the ground in 1909 but was rebuilt and reopened by 1911 and continues to offer guests the tradition of friendliness, hospitality, outstanding food and unique lodging. Another tradition is Rebecca’s Sunday Brunch Buffet, offered every Sunday throughout the year from 11 a.m. to 2 p.m. The buffet is a smorgasbord of freshly prepared hors d’oeuvres, entrees, carved meats, salad, desserts and bread. Holiday hours may be different so be sure to call first and make a reservation. Since 1936, Doc Martin’s has been a Santa Fe landmark in the City’s historic district. The Inn has received many kudos throughout the years and was named “One of America’s Great Inns” by National Geographic Traveler. What were individual adobe homes now form the heart of this legendary inn that is home to Doc Martin’s, also a Taos legend for its extraordinary dining fare and a favorite place brunch on Saturday and Sunday. You’ll find an eclectic menu of New American fare with highlights of southwest flavors. Locals know not to miss the blue corn blueberry pancakes. The Lodge has been a place where guests come to enjoy the beauty of the sur-rounding New Mexico wilderness. You have to have a reservation to stay here. You don’t, however, need to be a guest at the lodge to enjoy brunch on Saturday or Sunday. Although you do need a reservation. The rustic style comfort food is eclectic and the menus change regularly depending on what’s in season. All is made-from-scratch. Brunch is from 11 a.m. to 3 p.m. Homemade black raspberry ice cream is a must. Another New Mexico home and National Register Historical Site has been transformed into culinary treasure. Considered the crown jewel of historic old Mesilla because of its history, it draws visitors from around the world. The Sunday Champagne brunch, served from 11 a.m. to 1:30 p.m., is a buffet of exotic fruits, delicious appetizers, hearty salads, made-to-order omelets, muffins, breads, house-made desserts, a festive chocolate fountain and up to three glasses of champagne per person. Reservations suggested. A fruit filled Mimosa Bar is the centerpiece of this fantastic Sunday brunch with a menu created by the father and daughter team behind the food magic. The cuisine is a reflection of southwest flavors and farm-fresh locally-sourced seasonal ingredients and changes based on the time of year. Brunch is served from 9 a.m. to 3 p.m. and is an innovative selection of dishes. How about a waffled grilled cheese and roasted tomato fondue? Or a biscuit and gravy chicken sandwich? Or chorizo potato has quesadilla? Enjoy a glass of New Mexico beer or wine with your meal inside or out on the courtyard. This small neighborhood restaurant is owned by a chef whose culinary journey began in New Mexico, then took him to Paris, the Netherlands, a cross-country trip of the U.S. and landed him right back in New Mexico. His cooking is a mix of flavors from these travels and spotlights high quality ingredients cooked in an unpretentious way. Brunch is served on Sunday from 10 a.m. to 2 p.m. The distinctive brunch menu features entrees like Croque Monsieur, huevos rancheros and a rustic Bistro burger, plus appetizers, salads and soup. Desserts are homemade, so save room. Historic Sena Plaza in the heart of Old Santa Fe plays host to this charming and popular restaurant. With a 1,000-bottle wine list, a menu that features local ingredients in each innovative dish and a patio that’s the perfect outdoor dining venue, brunch here is an unforgettable experience. Served on Saturday and Sunday, the special menu features such delicious choices as crab cake eggs Benedict, brioche French toast, LCS traditional enchiladas, salad Nicoise and huevos rancheros. Reservations recommended. The resort is a place of rejuvenation for the body, mind and spirit. The restaurant is a place of rejuvenation for the palate. The Sunday brunch menu is a small but meticulously created selection of delicious meals. Duck confit posole, corn maiden tamale, blueberry muffin French toast and a green chile cheeseburger are just a few of the tempting choices. There’s dessert too. Try the Elvis, a chocolate torte with peanut butter gelato and banana brulee. Brunch is served from 11 a.m. to 2 p.m., reservations recommended and open to the public.